I had lunch with a coworker at a Cambodian restaurant in San Jose. Chez Sovan is literally a hole-in-wall family operated restaurant, and is only open lunch on weekdays. We arrived at ~1pm and they had run out of amok trey! My coworker and I decided to go family-style (sharing dishes) and ordered their “fish stew” which had the following description: cube of basa fish fillet simmered with coconut milk, Cambodian spices, eggplants, green beans and garnished with sweet basil. When the “fish stew” arrived at our table, we were confuzzled! It didn’t look like a stew at all. It also didn’t look like a curry dish! Instead, it looked and tasted like a coconut-curry based soup with fish and vegetables. This non-spicy dish can be eaten on its own, but it also went well with steamed rice. We also requested for chili pepper on the side, and added a bit to our own bowls for some spiciness. After doing a bit of researching online, I discovered that this dish is better known as samlor karko or samlor kako (សម្លកកូរ in Khmer) and is a traditional Cambodian soup. Samlor Kako is one of Cambodian national dishes. It uses an incredible range of ingredients to achieve its complex range of flavors, including the famous prahok or fermented fish cheese, which is unique to Khmer cuisine. 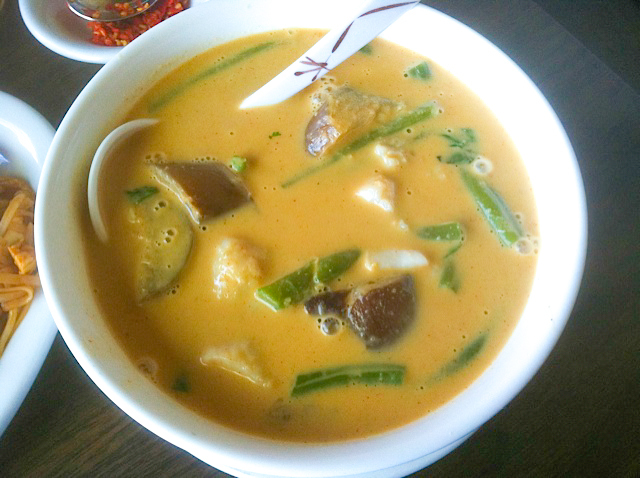 The Khmer Kroeung (spicy) and Prohok (fish paste) are rarely absent in Cambodian cuisine, especially in soup. 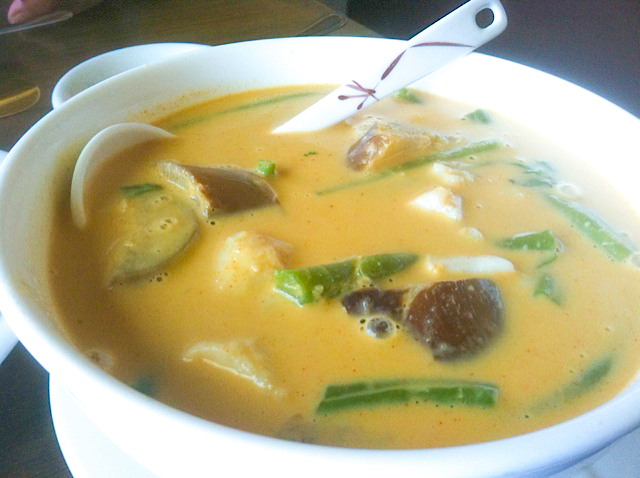 Samlor Korko (សម្លកកូរ) is among most favorite Khmer soup for daily family dishes. It’s a spicy fish soup composed of many kinds of vegetables. And it’s the Khmer soup that used both Khmer Kroeung and Prohok. Samlor Korko has a long history in which it was a royal dish and later on the receipt was revealed to outside the palace and become popular by all Cambodian. ‘Samlor’ in Khmer means ‘soup’, ‘korko’ means ‘to stir or to mix’. For Samlor Korko, it’s meant ‘mix-soup’, in which it is cooked with as much as of vegetables of various kinds, depend on favorite. However, to have a nice served of Samlor Korko, it need time to prepare. As today, many kinds of ingredient for various dishes are prepared into sets and are available at the super market, included a set of Samlor Korko ingredients.